Red class have been incredibly creative this week, producing a number of brilliant art displays. 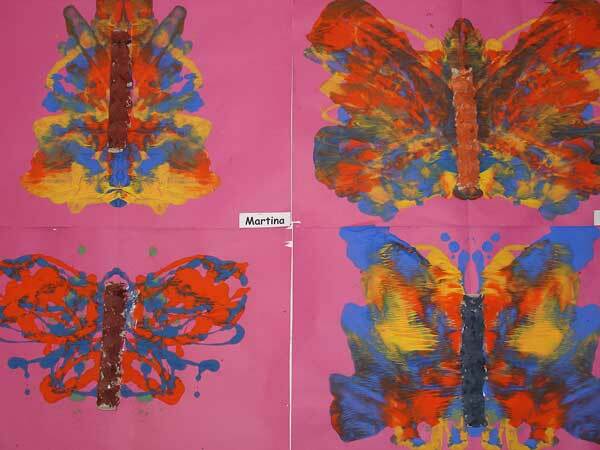 As part of the preparation for our school assembly, the children have produced some beautiful butterfly pictures. We have been seeing how the wing patterns on a butterfly are symmetrical. We used this technique in our paintings, folding over the picture to create a mirror image of one of the wings. Red class have also produced a class display based around our current reading book, No Room for Pooh Bear. The story tells how Pooh Bear stores everything in his pouch – our artwork reflects this too! Finally, red class have also made a selection of puppets to accompany our work on the Brown Bear book. We have been using these to act out the story.